I spent four hours, yes, four hours, at Chinatown Centre on Spadina on February 10. The band from HMC Ship York started the proceedings with “O Canada.” They performed it solemnly without the fancy trills which seem to be popular these days. It was nicely done. 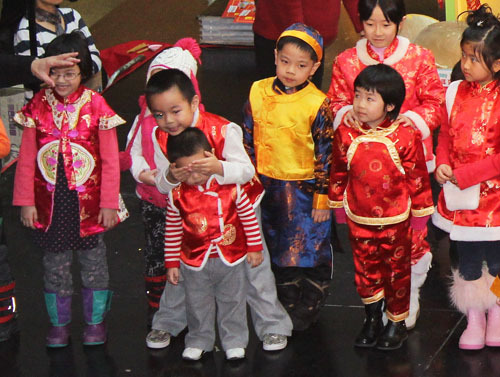 I loved the Chinese lion and dragon dances, thunder drumming, and cute kids in Chinese clothes. The official greetings took about forty minutes – police and fire officers, politicians, the Chinese consul-general, sponsors, hosts, etc. Speeches are expected in real Chinese events. There was a lot of waiting time in between the good stuff but it was worth it. It was great to see popular MP Olivia Chow on stage dotting a lion’s eye, bringing it to life and feeding it. Then the lion apparently wanted to get chummy. The show was amazing. 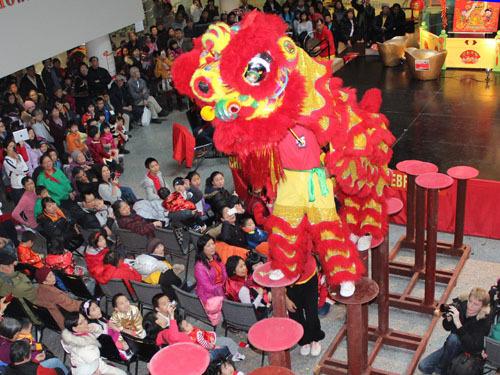 Two different kung fu clubs performed lion dances as drums and cymbals banged and clanged out the rhythm. Each club used several lions. During the dances, the back end of the lions swung the front end. I guessed this was to send out many more good vibes. Lions from both clubs danced precariously on pillars. It was dangerous and thrilling. One lion slipped on a piece of lettuce and fell off a pillar, but gamely got up and continued to much applause. 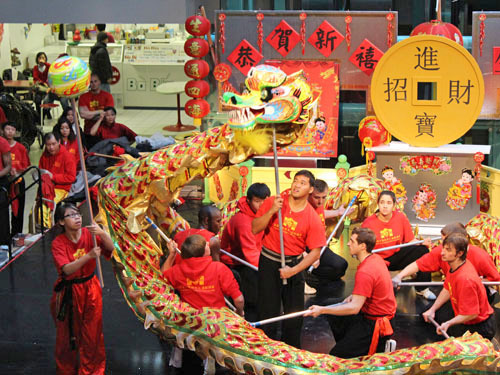 The Wushu Tae Kwon Do Centre of Burlington performed its undulating dragon dance. It was beautiful as it writhed up and down chasing the traditional “pearl.” Watching it is supposed to give even more good luck to the audience. We certainly got a lot that day. Emcee Alan Lai invited the children to come up on stage. Some of them sang songs in Chinese to the tune of “Oh My Darling Clementine.” They were adorable. They were all dressed in new Chinese clothes. I ate an egg tart at my favourite Furama Cakes and Desserts, (nearby at 248 Spadina Ave.) and bought some yummy, traditional, barbecued duck from the Kom Jug Yuen (371 Spadina Ave.) to take home for dinner. This restaurant was recommended by the woman sitting beside me. These were the only items I paid for that day besides the TTC. But my celebrations are not over yet. I’m taking some relatives to the Chinese seniors’ party at St. Paul’s L’Amoreaux Centre in Scarborough, and we’re having our family dinner at the Chinese Halal Restaurant (Finch & Leslie). This Sunday, I might follow the lions at the Gerrard Chinatown. I’m meeting a friend at my favourite Vietnamese restaurant there, the Hanoi 3 Seasons (588 Gerrard Street E.). I’ll try to eat some Korean, Singaporean and Tibetan food too during the 15-day holiday period. 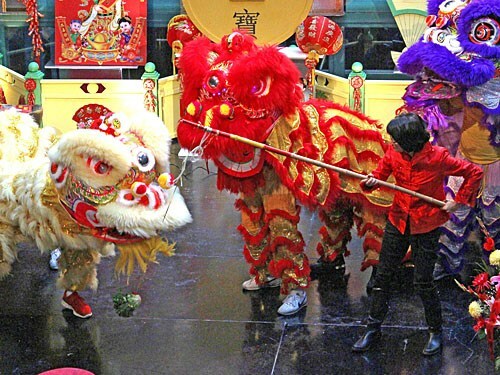 The lunar new year is a many-splendoured, multicultural thing. Those kids are soooo cute! And your descriptions of the food make me miss yummy Chinese food. Ruth, I hope all the good vibes and good luck give you and yours an amazing Snake Year, with continued great health and happy blogging! different cultures there too. Ruth. It was good to hear from you, and I’m sorry you haven’t found a Chinese restaurant yet. At least you have some culinary variety. Happy New Year. Ruth.